1. Mix eggs and sugar in a spouted measuring cup. Add milk and mix well. Add vanilla extract if you like. 2. Preheat an electric oven to 250C (482F) / gas oven to 230C (446F) / or you can use a toaster oven. 3. Butter the pie dish. Pour half of the custard liquid through a sieve into the pie dish. Place some bread crusts. Then pour in the rest of the custard liquid and leave for about 5 minutes so the bread can soak up the liquid. 4. Place the pie dish on a baking sheet. Pour some hot water into the baking sheet. Bake in the oven for about 10 minutes. 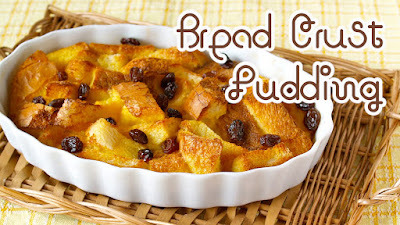 Top with raisins if you like and bake for 5 minutes. *vanilla extract is optional. I wouldn't add it since my eggs don't smell bad.